Chick-fil-A Recruiting Wrap Up is held on National Signing Day at the Clemson Football Indoor Practice Facility. This fun and exciting event will celebrate the newest football team members with video highlights and commentary, dinner, and a live auction. Tickets will be for sale online first to Forthill Clemson Club members beginning in early November 2019. Tickets will be available to the public approximately 1 week later. We highly recommend purchasing tickets early as we sell out quickly. All proceeds fund scholarships for Clemson students from Oconee and Pickens Counties and Pendleton High School. 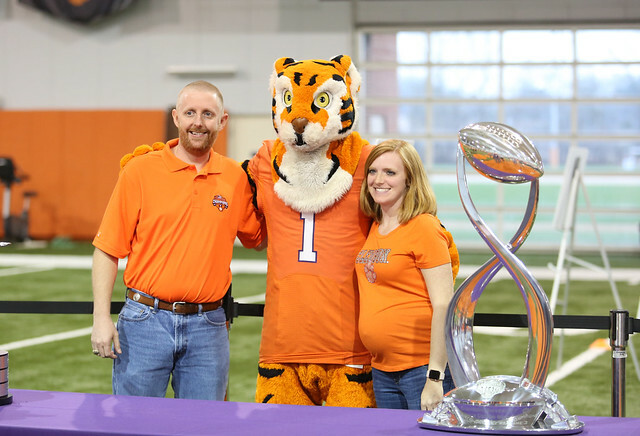 Check back to www.forthillclemsonclub.com often to view updated information. The event is typically 2 hours. There are no ID requirements or age requirements to attend this event. All children over the age of 3 must have their own ticket. Please contact forthillclemsonclub@gmail.com with any additional questions about the event. Your ticket is transferrable as long as the person is in possession of the email with the ticket or printed ticket from the email. Parking will be directed by event parking attendants and will be in the designated areas around the Indoor Practice Facility. Is the Clear Bag Policy in effect for this event? Sorry, there are no refunds because the money is for student scholarships.